Top Roofer | Brandon, FL | Dynamic Roofing Concepts Inc.
With the Tampa bay region receiving an average of 47 inches of rainfall annually; it’s essential to have a strong, quality roof over your head to protect your home, valuables and investments from becoming drenched. 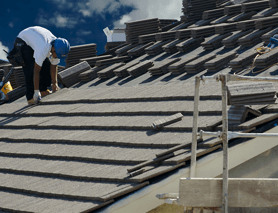 Trust a local Brandon roofer specializing in roof replacements and repairs and with over 43 years of experience in building high quality roofs. Dynamic Roofing Concepts Inc. looks forward to installing your new roof and becoming your preferred roofer in the Tampa Bay area. Why Choose Dynamic Roofing Concepts Inc.? At Dynamic Roofing Concepts Inc., we understand that you have a lot of choices when it comes to roofers. We want to be your top choice when it comes to roofing solutions for your home and business. We pledge to earn your loyalty by only providing top quality materials that are guaranteed to last, and servicing your home or business with a team of specialized, experienced and knowledgeable roofers. Dynamic Roofing Concepts dedication to quality and service has won us numerous awards, including the prestigious GAF Triple Excellence Award for our unmatched ability to provide our customers with outstanding service, support and performance. We are committed to earning your trust, respect and complete satisfaction with your new roof. When you’re ready to have a superior, professional roofing company install your new roof, give the experienced team of specialists at Dynamic Roofing Concepts a call today at 813-657-7663. For estimate requests, we’ve supplied a convenient and simple online request form. We look forward to becoming your preferred roofing company in the Odessa, Brandon and Tampa Bay FL region.